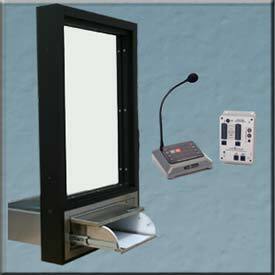 The Q-TRAN-619S Drive Through Transaction Station is a pre-designed drive thru combination window/drawer/intercom unit for checks, cash, and other small item transfers. This unit is glazed with Level 1 Bullet Resistant Glazing for security. This station has the QSP-619S Drive up Transaction Drawer with speaker , already installed in the framing. An Audio Authority Intercom System is pre-wired and tested and included with the package. This one piece transaction station comes with mounting brackets for easy installation at the job site. QS-619S Drive Through Transaction Drawer with Speaker. Finish: 304 Stainless Steel with number 3 finish. Level 1 Bullet Resistant in closed position. The 1500 Series is a complete, cost-effective solution for one teller or pharmacist to communicate with one or two drive-up lanes. The Model 1500A works with any of our Transaction Drawers. Made in the USA. Kit 1500 Series includes a 1500A Counter Station plus a 1520 Lane Station. Designed to minimize cost for simple 1-on-1 or 1-on-2 drive-up applications, it incorporates the great features and sound quality of our versatile 1500 Series in a less expensive design. The 1500A Counter Stations connect directly to a special 1520 Lane Station via Cat 5e/6 for easy installation. It is pre-wired and tested in our shop to ensure ease of installation.